The National Portrait Gallery in Washington D.C. has a show worth seeing: Elaine de Kooning: Portraits. The exhibition gives an in-depth view into the creative process of the wife of Willem de Kooning, a famous a Dutch American abstract expressionist. Elaine (1918 - 1989) focused on portraits of friends and family. Her work was valued during her lifetime and her friends included Allen Ginsberg and Fairfield Porter. Her figures, done in vivid colors and wide brushstrokes, are large-scale, impressive, and intense. Even across an exhibition room, her portraits hold attention and make a statement. Elaine did many studies of each subject - in charcoal and in paint. She enjoyed working on the same pose until she captured the person's personality - something special about them, something that set them apart, e.g., a gesture or the warmth of their eyes. Ultimately, through her work, she was seeking an answer to "What makes a person?" question (apart from the physical aspects of each individual). Color scheme was a huge element in conveying a person's character. 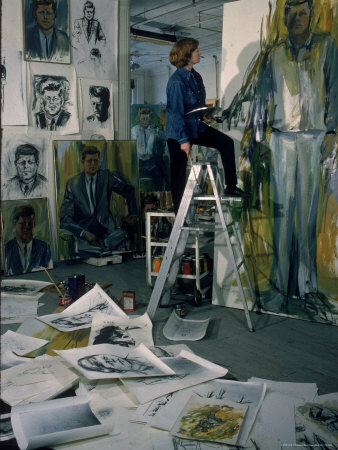 Elaine de Kooning is famous for her portraits of John F. Kennedy. She characterized them as “a glimpse” of the president through an accumulation of sketches and finished likenesses. In 1962, Elaine was commissioned to paint his portrait during his winter sojourn in Palm Beach, Florida. As with her other portraits, Elaine did many sittings with the President and tested out different media to capture his personality and her impression of him. If you have time to spare and want to learn about Elaine's work, stop by the National Portrait Gallery. Elaine de Kooning: Portraits is on display March 13, 2015 - January 10, 2016.